By introducing sparkling touches of gold, Weekes prevents the calm, watercolor quality of the living room's decor from losing its edge. 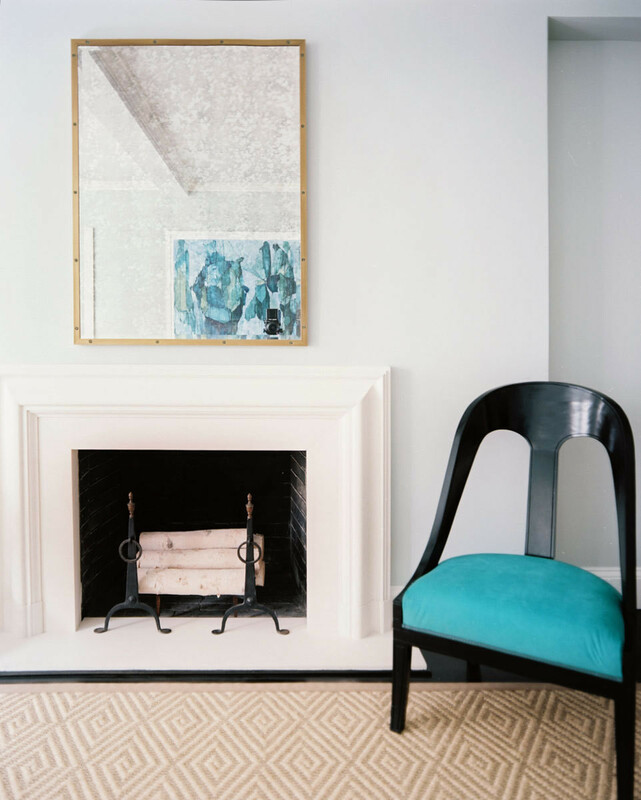 Last summer, designer Lilly Bunn Weekes was called upon to renovate a spacious prewar apartment on Manhattan's Upper East Side. The three-bedroom residence, recently purchased by a young couple with two growing daughters, was rife with possibility, but it was also in need of a makeover. 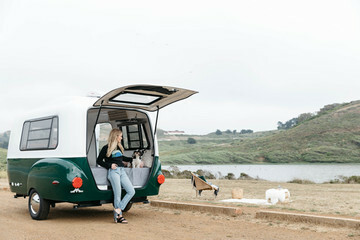 Its elegantly proportioned rooms were ill-equipped for small children, and the kitchen and bathrooms were woefully lacking in modern conveniences. 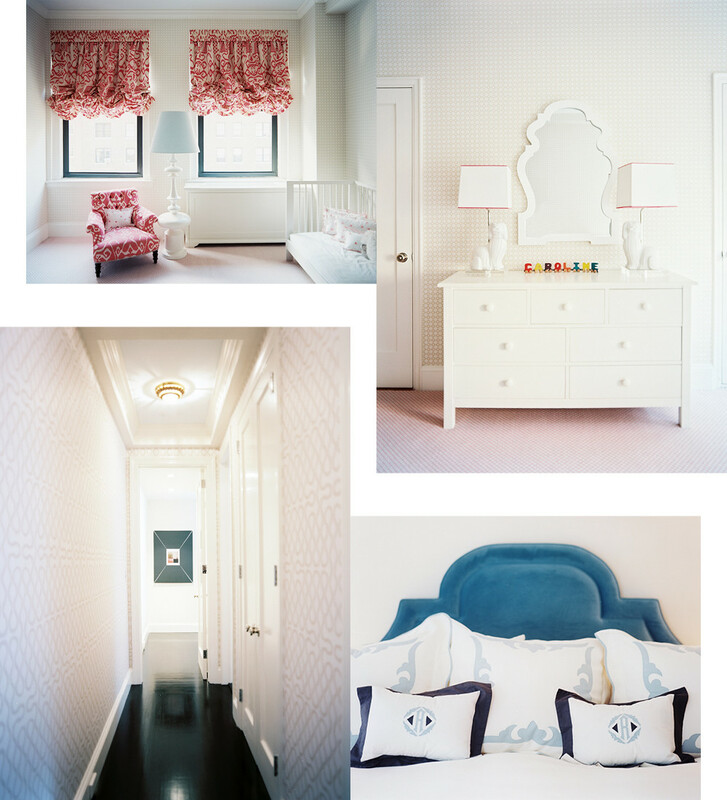 Designer Lilly Bunn Weeks in a sunny bedroom in the uptown apartment she designed for her clients. 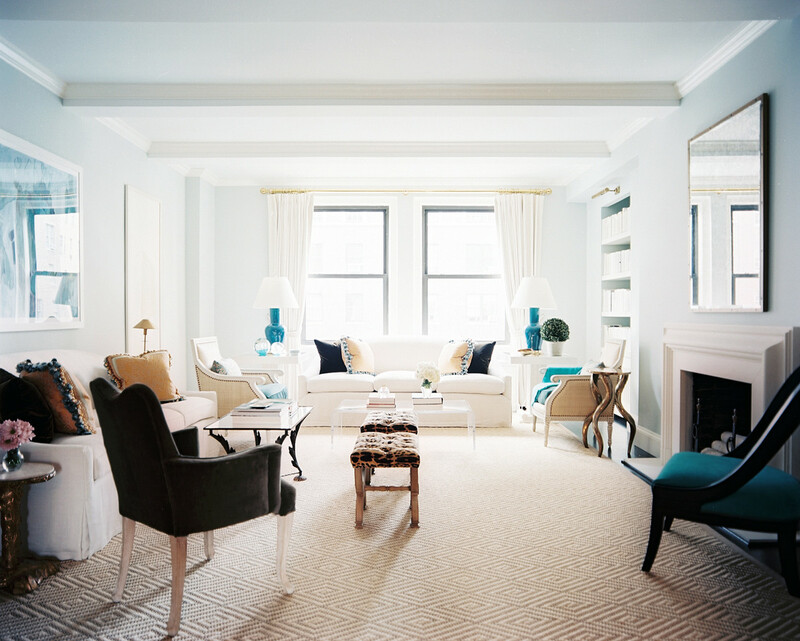 Though brimming with urbanity, this elite Manhattan address remains a cozy family home. The living room's soothing color scheme thrums with texture and pattern, from the bookshelf's selection of vintage ivory-spined reads to the carpet's rich diamond motif. For help in creating a comfortable yet gracious family home, the owners couldn't have chosen a more suitable candidate than Weekes. 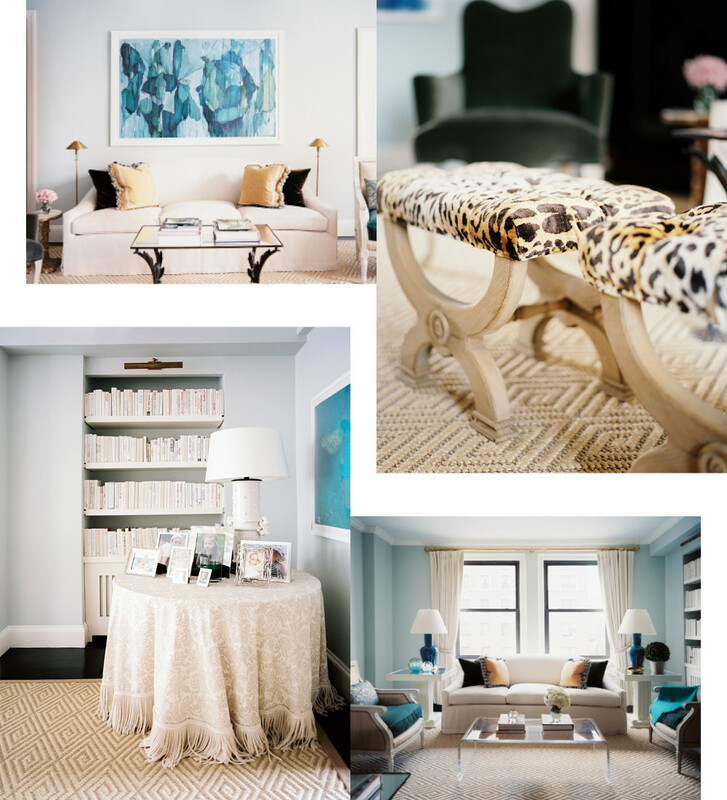 Though she boasts and Upper East Side background and spent five years in the fashion department of tony Town & Country magazine, the designer specializes in crafting spaces that are high in style, but not in pretense. 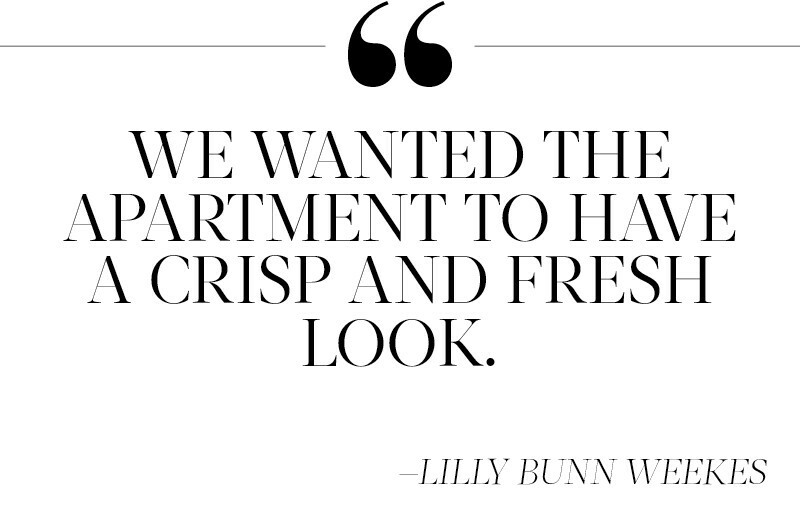 "We wanted the apartment to have a crisp and fresh look," Weekes says. "But it also had to feel usable, a place where the adults could relax and the children could play." 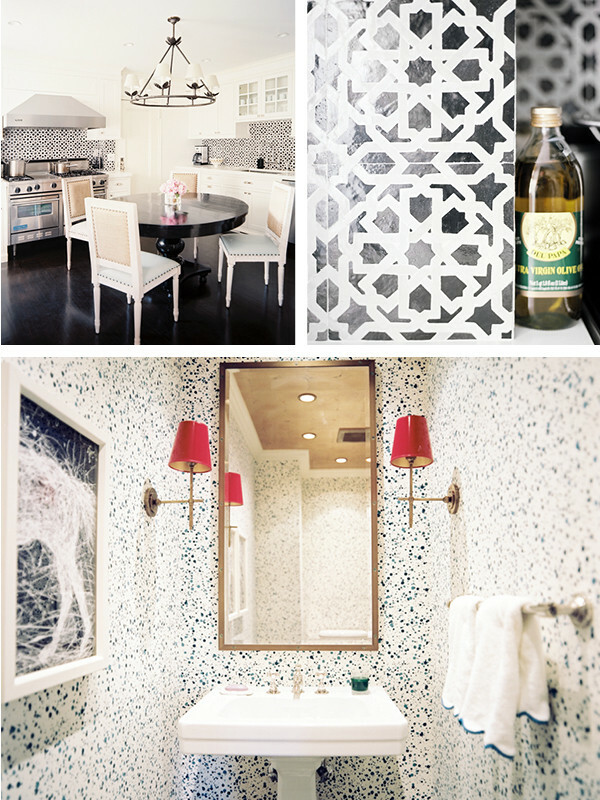 Above: Moroccan-style ceramic tiles supply a pleasing jolt of aesthetic energy to an elegant eat-in kitchen. Below: Hinson & Company's riotous splatter-print wallpaper and a pair of imerial-red-lacquered lampshades transform an intimately proportioned powder room into a work of art. has some terrific, well-priced upholstered pieces—and you can always re-cover them in your own fabric, like a luxe tiger-print velvet! makes the best high-gloss paints. The colors are amazing and have so much depth and shine. has a great selection of tiles. 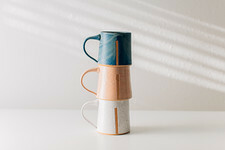 They come in a variety of colors and patterns, and can work anywhere. Clockwise from top left: In the nursery, vibrarnt window treatments recall hot-air baloons; in the master bedroom, supple teal upholstery strikes an ideal balance of masculine and feminine sensiblities; a long, narrow hallway is lent interest and allure by an animated Cole and Son wallpaper, ebony-stained hardwood floors, and a delicately painted ceiling. 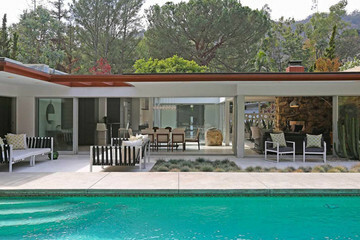 To achieve this delicate balance of luxury and ease, Weekes installed space-age fixtures and appliances, but she also selected a serene, sophisticated palette, along with a series of sumptuous appointments. Covering the floor of the television room, for instance, is a handsome silk-and-hemp ikat rug that makes a perfect play surface. 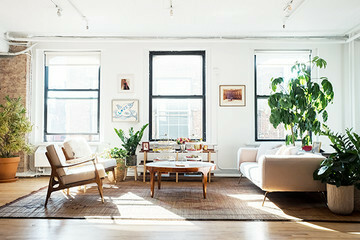 And the apartment's ample, eat-in kitchen—an especial treat in square-footage-challenged Manhattan—is both a boho-chic hangout and a locus of family life. "There's a quotation: 'Interior design is the fashion of your 30s and 40s,'" says Weekes. 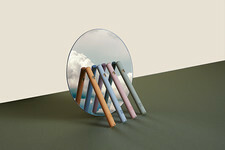 "One of the reasons I think that's true is because interiors are about homes and families. That's one of the reasons I was attracted to this career. I'm a mother now, too, and it's very satisfying to help a family make a home." The simple scrolled pattern of the bed's custome Leontine linens evokes a sense of laid-back luxury. 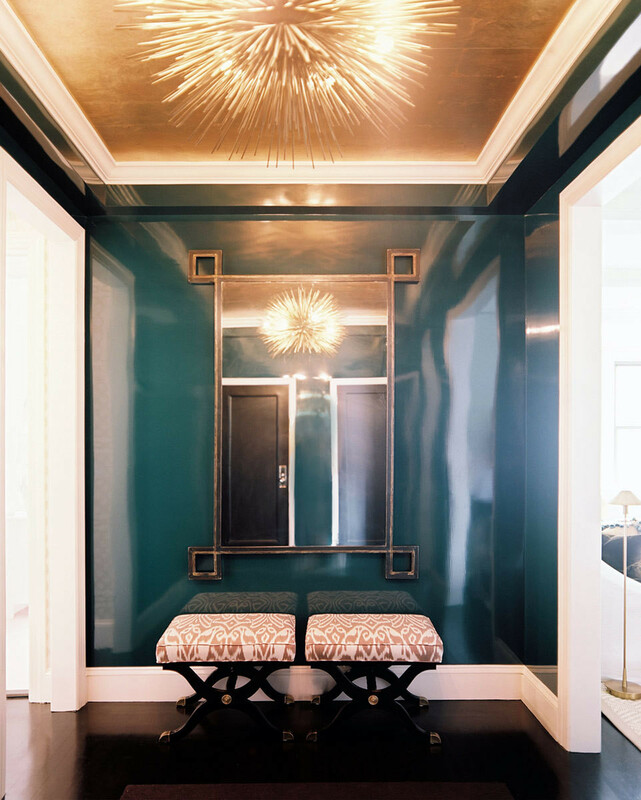 With smoldering peacock-blue lacquered walls and a ceiling that resembles goldvermeil, the entryway greets visitors with drama and panache.